My Mother in law, Joyce Leiss married Bernard (B.J.) Green in Kansas 1955. She was 24 years old at the time. Joyce wore an Ivory Satin Dress with a Lace and Tulle Overlay. It was a Tea Length gown with a sweetheart neckline. The Dress was outfitted with a matching lace bolero. The veil was attached to a small brimmed hat. Bernard was 30 years old and wore his Dress Navy Uniform. They were married for 18 years. Joyce finished her education at Emporia University and became a 6th Grade School Teacher. She retired from teaching about 20 years ago. Today she enjoys her retirement at a rest home in Emporia, Kansas. Joyce is married in lace and satin wedding dress in 1955. 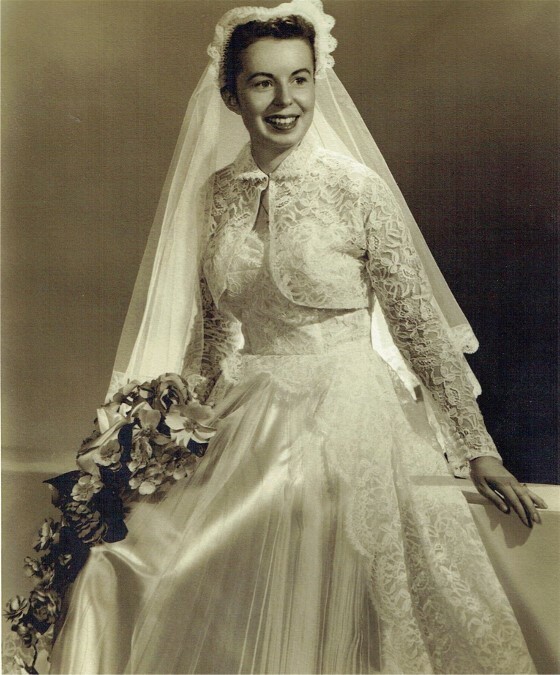 Kathleen sent us her mother-in-law’s beautiful, vintage, satin tea length sweetheart wedding dress with lace overlay to receive wedding dress restoration and preservation. When we received it had severely yellowed from age and had some insect damage. The tulle on the front had several holes. There was also severe yellowing under the arms. The lace of the bodice was very brittle and had several holes. The bolero was also in similar condition. We removed and replaced all buttons with new buttons. We gave Joyce’s wedding dress a chemical treatment to whiten the color and remove oxidized stains. We reinforced the lace of the bolero with tulle and repaired the holes in the lace of the gown and bolero. The results are stunning! 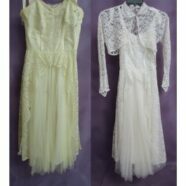 The yellowed wedding dress is once again white and lovely. We preserved it in an acid-free and lignin-free wedding dress preservation box. Joyce and her family will enjoy this beautiful gown for many years. Get a Free Quote for your wedding dress restoration today! Joyce’s vintage wedding dress before wedding dress restoration. Joyce’s vintage wedding dress After wedding dress restoration.